The unprecedented attacks by sharks on human beings along the middle Atlantic coast of the United States in the summer of 1916, resulting in the death of four bathers, produced a profound sensation and materially interfered with the attendance at seaside resorts, while leading to an astonishing amount of newspaper discussion in the course of which the public was regaled with more fiction and also more facts about sharks in general than ever before in our history. Several departments of the federal government became involved in the matter, various individuals and committees offered rewards for the capture of "man-eating" sharks, and a bill was introduced in Congress appropriating money for the purpose of enabling the Department of Commerce to coöperate in the extermination of man-eating sharks on the New Jersey coast. The Bureau of Fisheries was incessantly importuned to explain why sharks were behaving as they were, and to take action that would prevent further attacks. There was some criticism of our inability to cope with the situation, although obviously there was little that could he done. The culprits were never identified. It was not known whether one individual shark of a species common to the region was running amuck; whether representatives of several local species had been forced to attack human beings because of certain undetermined biological or physical conditions; or whether there was an advent of a shark or sharks from distant waters with feeding habits different from those of the domestic species, which in no former years had exhibited any man-eating tendency and were dangerous only when they themselves were attacked. 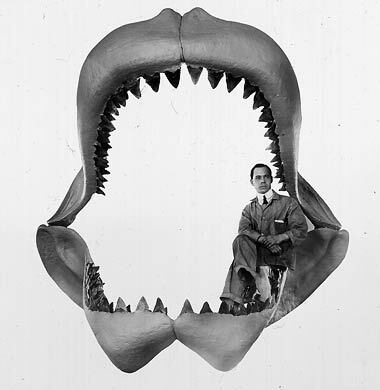 There were no attacks reported after the middle of July and the scare subsided; but out of all the excitement and discussion there has arisen a keen lay interest in sharkstheir kinds, habits, size, distribution, and economic value; and in answer to that interest there have been special displays in museums and publication of much authentic matter in the secular and scientific press. Hugh M. Smith. 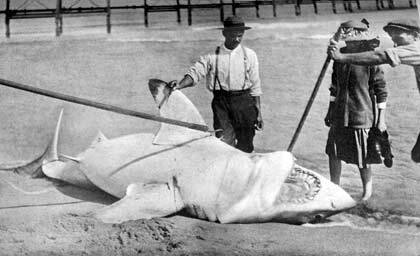 Great White Shark or Man-Eater, taken Off Palm Beach, Florida: This young twelve-foot specimen of the great white shark (Carcharodon carcharias) was taken by Mr. Sidney M. Colgate in December 1913, while out hunting sharks with Iris family. Man-eaters were not expected; other sharks generally succumb quietly when harpooned. This creature, however, when struck, turned and hit the wooden harpoon pole in two, attacked the launch with such vigor that it sprung a leak, and was only finally dispatched by several revolver shots. These sharks are characterized by large size and voracity, and by unusually large mouth and teeth, which render them very capable of man-eating, and circumstantial evidence also accounts for their sinister name. The maximum length attained is about forty feet, with teeth three inches long, but from the size of fossil teeth found it is thought that in the past individuals of the same genus (Carcharodon) must have attained a length of seventy to eighty feet [but see note 3]. The white shark inhabits tropical waters and is rarely found within fifty miles of New York. NOTE: Where necessary, the Latin binomials in this text have been updated courtesy of R. Aidan Martin, co-author of Sociable Killers, an article about white sharks featured in the October 2006 issue. While this fish occurs regularly, although not abundantly, in summer along parts of our coast where sea bathing is extensively indulged in, it must be regarded as comparatively inoffensive in our waters even if the recent fatalities on the New Jersey coast are attributable to it. Model, in the American Museum of Natural History, of jaws of the gigantic fossil shark, the largest and probably most formidable fish of which anything is known. It attained a length of about eighty feet and is an ancestor of the present-day great white shark, or man-eater [but see note 3]. In the same family with Carcharodon, and distinguished therefrom by having the edges of the teeth entire instead of serrate, are the mackerel sharks, of which four species may be found on the Atlantic coast (all of these are now placed in the genus Isurus by Garman; The Plagiostomia, 1913). 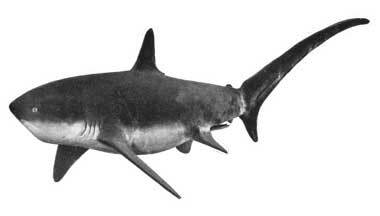 One of these (4), a cosmopolitan species in temperate latitudes, is the porbeagle of England (Lamna nasus). It attains a length of ten to twelve feet. The common species on the east coast of the United States is the blue shark of the Cape Cod fishermen, readily distinguishable by the large black spot on the pectoral fin. It reaches a length of eight to ten feet. The mackerel sharks are handsome, trim, and active species, and are so named because they are present chiefly during the mackerel season and prey largely on that fish. They are sometimes very annoying to purse-seine, pound-net, and gill-net fishermen. Basking or bone shark (Cetorhinus maximus). A harmless, sluggish, gigantic shark (nearly forty feet long) at home in the Arctic seas but sometimes straying south. Has been described as the fish that swallowed Jonah, but, in spite of its huge size and wide mouth, its minute teeth and large gill openings show that it feeds on very small marine creatures. The thrasher or swingle-tail (Alopias vulpinus) is distinguished from all other sharks by the astonishing length of its tail, which may be six or seven feet in a large specimen. It is a fish feeder, circling around a school of fish, using its tail to whip the water and keep them together until the moment of engulfment. A pair of thrashers sometimes fish together in this manner. The theory that thrashers kill their prey by lashing it with the tail is not borne out by observation. quite a number of individuals ranging from twenty-eight to thirty-five feet in length have been reported, but recently the species is rare in our waters. Its disposition is peaceful, and it is dangerous only because of its great bulk. When attacked, its powerful tail easily demolishes boats, and its pursuit has been attended by considerable excitement and risk. The thrasher or swingle-tail (Alopias vulpinus) is another large and active pelagic shark which is common along the coasts of New England and western and southern Europe, and is known also from California. It is at once distinguished from all other sharks by its prodigious tail (see photo below), the tipper lobe of which, in the form of a scythe blade, is half the total length of the fish. The fishermen tell tales of the ferocity of this shark in attacking whales, which, when they come to the surface to breathe, are said to be flailed by the thrashers flexible tail, so that the resounding whacks may be heard for several miles in calm weather. Authentic observations of this habit are lacking. The species is certainly harmless for man, in spite of its large sizeit attains a length of fifteen feet and a weight of five hundred pounds. It is a source of some annoyance to our mackerel fishermen because it often becomes entangled in the nets. In July, 1904, an imperfect skeleton of this fish about ten and one-half feet long, with cranium and two hundred and seventy-four vertebrae, was exhibited at Atlantic City, as that of a sea serpent, and an impossible account of its capture was published in the local newspapers at the time (for identity of this skeleton, see note by the writer in Forest and Stream, December 3, 1904). 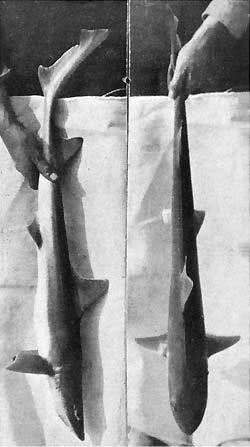 This ten-foot hammer-head shark was caught off Cape May, New Jersey, in August, 1916, by the United States Fishery schooner "Grampus." It appeared when one of the crew was swimming near the vessel and took a hastily baited hook as soon as one was put overboard. When caught with rod and line the hammer-head is said to be one of the gamest of sharks, continuing to struggle violently until it dies from exhaustion. This shark probably breeds in the neighborhood of New York, as a very small one has been found on the Long Island shore, and most of the specimens captured in the north are not full grown. In strong contrast with the striking modification of the tail in the foregoing species, the hammer-head and the bonnet-head sharks (Sphyrna zygaena and S. tiburo), present grotesque lateral expansions of the head. Both species range from the tropics along our east coast as far as Massachusetts. The former is a voracious species and, attaining a length of more than fifteen feet, is formidable to man; the latter, much the commoner on our South Atlantic coast, rarely exceeds five feet in length. Mitchills Fishes of New York records the capture of three hammer-heads in a net at Riverhead, New York, September, 1805; the largest, eleven feet long, contained the detached remains of a man and also a striped cotton shirt. The sand shark (Carcharias taurus) is one of the best-known sharks of our Atlantic coast. It is sometimes called shovel-nose shark and dogfish shark on the shores of New England. Its usual length is under five feet, but it is said, perhaps on account of error in identification, to attain a length of twelve feet and a weight of two hundred and fifty pounds. It is built on rakish lines, its snout is sharp, its crescentic mouth is armed with long and narrow teeth, the fishermen say it has a wicked eye, and its disposition is vicious. It is able to do very serious injury to careless fishermen who are trying to remove it from their nets or boats, and the writer has seen it inflict fearful wounds on other species of sharks confined with it in the observation pool at Woods Hole, Massachusetts. The largest family of sharks in our waters is the Carcharinidae. 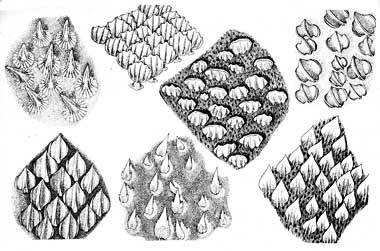 (5) The many genera however are not always easily distinguishable until the teeth and dermal denticles are carefully examined (see illustration below). Shark Skin Under the Microscope: The skin of a shark has no scales, but is rough like sand paper owing to numerous minute asperities called dermal denticles, These when viewed under the microscope are seen to be of various forms, each form characteristic of the species of shark it is found upon. In his paper The Sharks and Rays of Beaufort, North Carolina, Mr. Lewis Radcliffe has even made the denticles a criterion for separating closely related species. In the case of the nurse shark (Ginglymostoma cirratum) the denticles are so large and strong that it is difficult to drive a harpoon into the fish. Scientific names of fish are not always expressive of obvious habits or structure, but Somniosus microcephalus, or the small-headed sleeper, aptly describes a large boreal shark that makes occasional visits to our coasts as far south as Cape Cod and Oregon. Its body seems to have developed at the expense of its brain, for it is a sluggish stupid glutton that reaches a length of twenty-five to thirty feet. It is said to be a very active foe of whales. When caught in the fisheries of western Europe, the sleeper shark is brought in by the fishermen and offered for sale as food, although its market value is small. The writer has seen it in the markets of Grimsby, Cuxhaven, and Hamburg. One of the rarest and at the same time most strongly differentiated sharks on the coasts of the United States is the cow shark (Hexanchus griseus), at once recognizable by its single dorsal fin, and its six gill apertures (see photo below). The dentition also is peculiar (in the front of the tipper jaw there are four pointed teeth, on each side of which are three with one or several cusps, and laterally the teeth have many cusps; while in the middle of the lower jaw there are a small tooth with or without a cusp, and lateral serrated teeth with many cusps). There appears to be only one instance of the occurrence of this shark in our waters, although it is said by Poey to be often found about Cuba. An individual ten feet two inches long was taken in 1886 at Currituck Inlet, N. C., a plaster cast of which is in the United States National Museum. On the shores of western and southern Europe, where the cow shark is most common, it attains a length of twenty-six feet or over. The cow shark (Hexanchus griseus) is a primitive type of shark, peculiar in possessing six gill slits; most modern sharks have but five. Its single dorsal fin is also a distinguishing feature. It attains a length of twenty-six but is rare on United States coasts. The smallest shark known (Squaliolus laticaudus), adult female about four and one-half inches long. It is a deep-sea form represented at present by a single pair taken in Philippine waters, at a depth of one hundred and seventy fathoms. The deep-sea sharks are mostly small and dark colored but in structure do not differ markedly from other species. This whale shark (Rhinodon typus) was taken in Florida in 1912, was grotesquely stuffed, as shown in the cut, and exhibited as a marvel. About forty feet long, it belongs to a species dangerous only on account of its bulk. and very broad tail, and is jet black, with the fins wholly or partly white. The species is represented by a single pair, of which the fully developed male (which is larger than the female) measures less than six inches in length. It is believed that no other shark is so diminutive. We have not yet spoken of the largest of all sharkswhich means the largest of all fishes of the world. This is the whale shark (Rhinodon typus), originally described from Cape of Good Hope, but now known from India, Japan, South America, Panama, California, and various other places. There have been two individuals taken on the coast of Florida, the first, a rather small one (eighteen feet long) obtained at Ormond in 1902; the second a veritable monster, caught at Knights Key in June, 1912. The skin of the fish was stuffed in a distorted shape (see photo below) and exhibited in various parts of the country as The Only Creature of the Kind in the World. The advertised length of the fish was forty-five feet, but from the best information obtainable it was somewhat more than thirty-eight feet long before stuffing. Hunting brown sharks (Carcharhinus plumbeus ) in Great South Bay, Long Island. The shark is harpooned from the bowsprit of a sloop, a bucket being attached to the harpoon line. A tender is lowered which picks up the bucket and hauls up to the shark (upper picture). The shark is then lanced (middle picture) and hauled on board. This species is not dangerous and is common in this vicinity in summer. 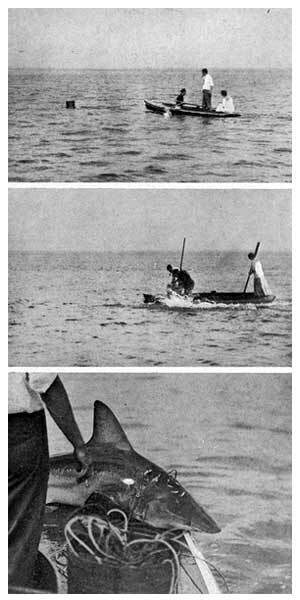 In a recently published paper Mr. Edwin Thorne, from whose sloop the above photographs were taken, mentions taking fourteen brown sharks in one day, and of the hundreds he has caught at various times all but two have been females. These enter the Great South Bay in midsummer to give birth to their young and may be found there until September. The brown shark feeds on crabs, lobsters, and various fishes. Its fin and tail are seldom seen above the surface, as are those of pelagic sharks. The sharks most numerous on the United States coasts are the small forms known as dogfishes, which belong in two distinct families and get their name from their habit of going in droves or packs like wild clogs. The smooth dogfish (Mustelus canis), is one of the omnipresent fishes of the Atlantic coast in summer from Cape Cod to Cape Hatteras, and is abundant on the lower Carolina coast in spring. It is a slender graceful species, without spines in the dorsal fins, reaching a length of three feet, and having pavement-like teeth adapted for crushing lobsters, crabs, and other bottom-loving creatures. The horny or spiny dogfish (Squalus acanthias) is found on both sides of the North Atlantic and is easily the most abundant and most destructive of our east-coast sharks. The spiny dogfish ranges as far north as the Gulf of St. Lawrence and south to North Carolina, and reaches its maximum abundance north of Cape Cod. Coming along our shores in schools containing untold millions, and one school following another often with slight intermission, these fishes do immense damage for fishermen by devouring or mutilating the food fish taken in the gill nets, by eating the bait and the line-caught fish, by chewing and tearing nets and lines, by filling pound nets to the exclusion of other fish, and by devouring lobsters in and out of the lobster pots. When the schools of dogfish appear, the fishermen must abandon their efforts, and the loss of fish and apparatus is thus supplemented by loss of time. There have been seasons when the damage to the fisheries of the New England coast by this one species has been fully a million dollars. The loss is accentuated by failure of the fishermen to make any use whatever of the dogfish because of the lack of a market demand in the United States, notwithstanding that the fish is wholesome and nutritious and is very extensively eaten in western and southern Europe. One of the great American needs at the present time is the shark-eating man. All sharks of sufficient size have a food value, and in many parts of the world sharks are regularly fished for and used for human consumption. In the United States the utilization of sharks has been negligible for several reasons; notably because of the abundance and variety of other food fish, and because of our ignorance of their food value, and our deep-seated prejudice on account of their unsavory reputation as consumers of the most promiscuous materials, including living and dead human beings. It may prove to have been a very unfortunate coincidence that the killing of Americans by sharks should have come at the very time when the Bureau of Fisheries was inaugurating a campaign to induce the wholesale consumption by Americans of one of the most destructive, though least dangerous, species of sharks. It remains to be seen whether, in spite of this untimely handicap, a movement in the interest of fishermen and fish consumers, based on indisputable economic facts, will not succeed. The Congress of the United States, at the recent session, appropriated $25,000 to enable the Commissioner of Fisheries to conduct investigations and experiments for the purpose of ameliorating the damage to the fisheries done by the dogfish and other predacious fishes. The act is aimed primarily at the spiny dogfish, and the task before the Bureau of Fisheries is to convert an unmitigated nuisance into a valuable asset. These views of Messrs. Nichols and Murphy are stated in full in the Magazine Section of the New York Times for August 6, 1916. THE EDITOR. 5. Our commoner species are the sharp-nosed shark, Rhizoprionodon terraenovae, ranging from Massachusetts southward, numerous on the South Atlantic coast, and reaching a length of seven feet; Carcharhinus isodon, originally described from New York and now known from North Carolina and various other places on the shores of the western Atlantic; Negaprion brevirostris, reported by Radcliffe as fairly common on the North Carolina coast, the largest individual taken being over eight feet long; Carcharhinus leucas, a common form in the Gulf of Mexico and throughout the West Indies, attaining a length of ten to twelve feet; the black-finned shark, C. limbatus, of almost cosmopolitan distribution in tropical waters, known from our coast since 1875 when specimens were taken at Woods Hole, where also a five-foot individual was observed by the writer in July, 1916; the cub shark, C. lamia [now considered the same species as C. leucas R. Aidan Martin, 2006], a common form on our southeast coast, represented in the American Museum of Natural History by a model of a specimen taken at Key West, an individual taken with rod and line in North Carolina in 1902 having been over nine feet long and live feet in girth; the dusky shark, C. obscurus, a very numerous species in southern Massachusetts in summer, common along the middle Atlantic coast, frequently taken with lines and nets, attaining a length of fourteen feet; the brown shark, C. plumbeus, often confused with several other species, not rare on the Atlantic coast from Cape Cod southward; and C. acronotus, a Cuban form of which a number of specimens were recently taken in North Carolina. On August 8, 1914, a small school of large tiger sharks appeared in the Fort Macon Channel near the fisheries laboratory and swam around the Fish Hawk. A baited shark hook thrown over the side was seized by the largest of the school. The line offered little resistance to this big fellow and he disappeared, taking bait and hook with him. During the time that elapsed while another hook was being secured and baited, the rest of the school came up under the stern of the ship, showing no fear of the men in the cockpit a few feet above them. Apparently the sharks were very hungry and were prepared to grasp anything that might fall to them in the nature of food. When the second hook was thrown over, it was seized by one of the school. This shark, which was killed and brought on deck, was eight and two-thirds feet in length. For the second time this hook was thrown overboard and soon another specimen, ten and one-twelfth feet in length was captured and hung from the end of the boom with its head out of the water. On the third cast, another, nine and one-sixth feet in length, was captured. About this time a shark, larger than any of those taken, swam up to the one hanging from the boom, and raising its head partly out of the water, seized the dead shark by the throat. As it did so, the captain of the Fish Hawk began shooting at it, with a 32-caliber revolver, as rapidly as he could take aim. The shots seemed only to infuriate the shark, and it shook the dead one so viciously as to make it seem doubtful whether the boom would withstand its onslaught. Finally it tore a very large section of the unfortunates belly, tearing out and devouring the whole liver, leaving a gaping hole across the entire width of the body large enough to permit a small child easily to enter the body cavity. At this instant one of the bullets struck a vital spot, and after a lively struggle on the part of the launchs crew, a rope was secured around its tail. The four specimens, all females, were brought to the laboratory for examination. The last shark was twelve feet in length, and the liver of the smaller one was still in its stomach, the estimated weight of which was forty pounds.